On November 13, H.E. Mme. 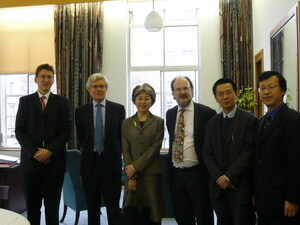 Ambassador Fu Ying came to the <?xml:namespace prefix = st1 ns = "urn:schemas-microsoft-com:office:smarttags" />School of Oriental and African Studies, University of London and met President Paul Webley and principals of the Department of Chinese, Chinese Studies Centre and Confucius Institute and discussed with them on issues of cultural exchanges and Chinese education. President Webley introduced Chinese studies and Chinese education in the School of Oriental and African Studies and denoted that the SOAS has a good reputation and a considerable scale of Chinese studies in Europe. With the development of China and increase of Sino-UK exchanges, the youngsters in UK become more and more interested in China and Chinese language. Chinese is the most favorite foreign language in SOAS. One third of the 5,000 students are learning Chinese in different forms. The Confucius Institute was founded in March 2006, which has more than 1,500 students and has achieved good teaching results and economic benefits. SOAS hopes to further enhance Chinese studies and Chinese education, vigorously improve the quality of teachers, strengthen bilateral exchanges with institutions and students in China, and bring into play the role of the commercial and media operations in promoting Chinese education. Fu Ying appreciated the contributions of SOAS and relevant persons to Sino-UK educational and cultural exchanges and denoted that the Chinese Embassy in the UK is willing to strengthen the cooperation with SOAS, including providing all kinds of Chinese references, dispatching diplomats to make speeches in SOAS and assisting to hold activities related to China, so as to enhance the understandings between the two peoples, especially between the youngsters and expand the channels and scopes for UK people to know China. Fu Ying also suggested that SOAS should make use of existing resources and programs to carry out the studies on mutual impression and cognition of the two countries, to which SOAS expressed its agreement and appreciation.